It felt like I was floating all last week with the realization that I had finally accomplished my long awaited goal of starting a health food blog. 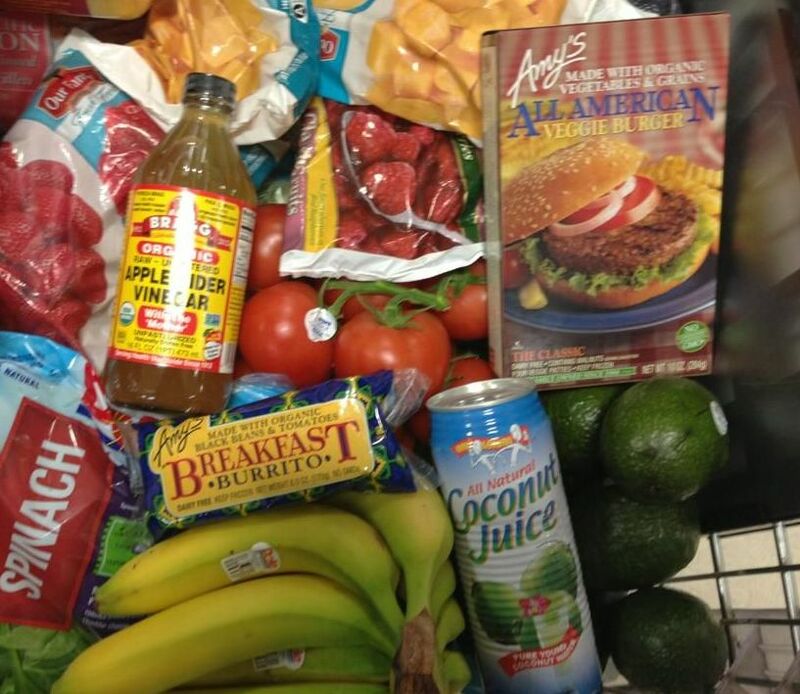 I no longer felt like an imposter when I snapped a photo of my food purchases in the supermarket. In celebration I sent a photo to my husband Mike. “Don’t people look at you strange when you take photos of your cart?” he texted back. “No, I’m a food blogger!” I triumphantly typed. I sometimes wonder if Mike knows what he truly got into when he married me. 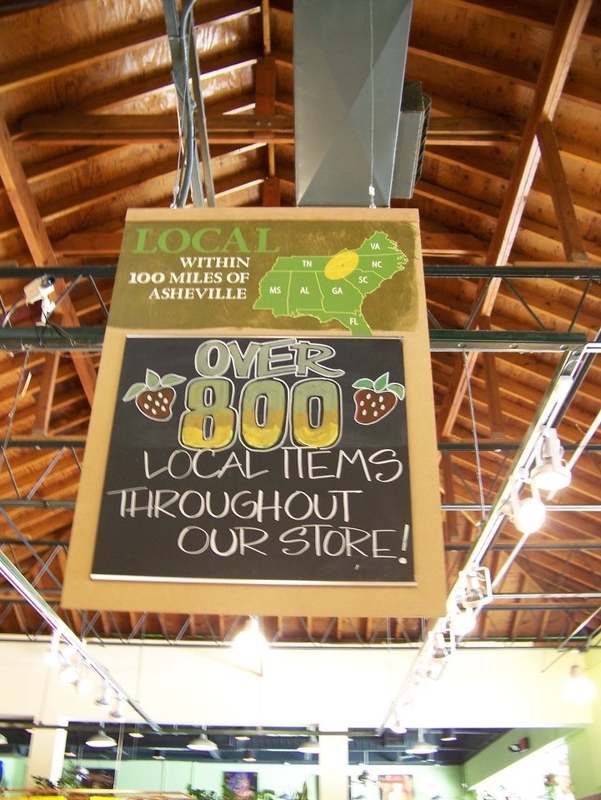 This brought back memories of a momentous occasion when we adventured to a Whole Foods in Asheville, North Carolina for the first time. One of my friends Brenda was anxious to learn more about the store and asked me to snap some photos to show her when I returned. I marched into Whole Foods and as soon as I picked my jaw off the floor, I furtively started to snap photos of the stunning array of produce. An employee looked amused and asked me what I was doing. A wave of embarrassment shot through my body and before I could marvel over the selection of living raw foods in the refrigerated case, I lied to him. “I’m a food blogger.” I explained that we did not have a Whole Foods in the Upper Peninsula of Michigan. He smiled and for a moment I thought he was going to pose for a photo. He returned to his work and so did I, merrily snapping photos and delighting in all sorts of new food finds that were discovering a home in my cart. True, my facebook posts are often centered around food and I routinely bring in food inspired writing prompts for my high school creative writing students. This fall I created a “sensory writing experience” for my young writers by bringing in fresh rosemary, basil, mint, sage, dill, cilantro, oregano, and thyme from my container garden to smell, taste, and serve as prompts to write about. 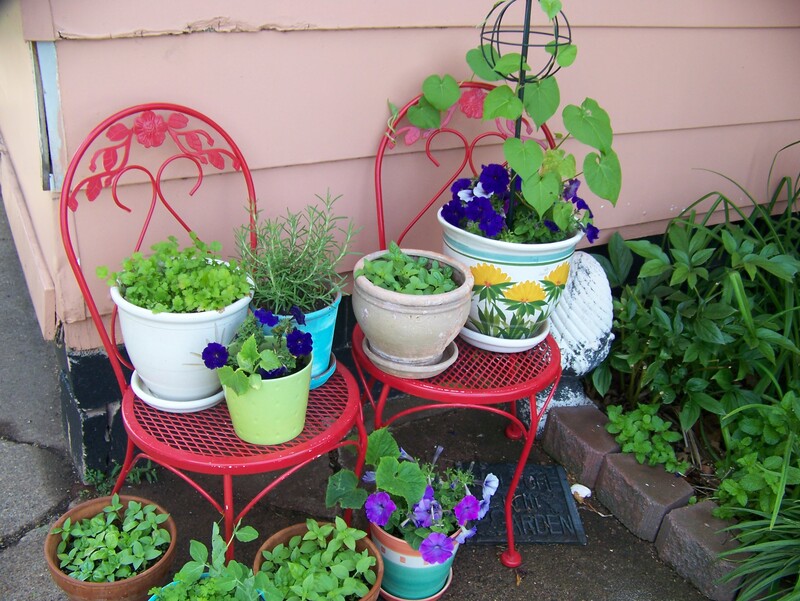 Many of them had heard of these herbs but did not realize that you could grow them yourself. 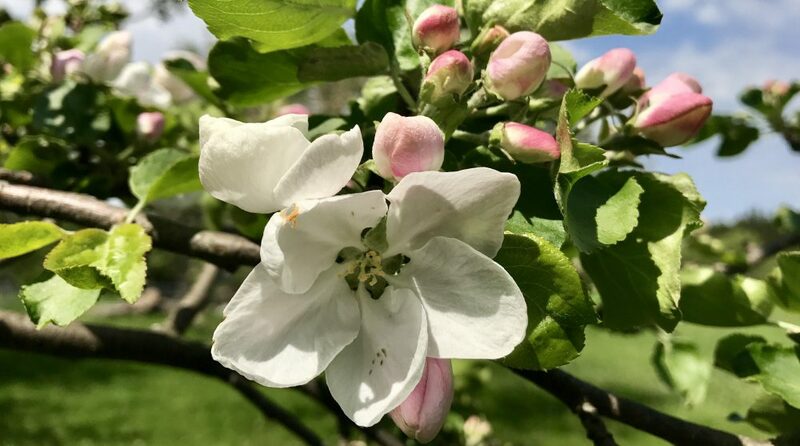 I am hoping that this experience made at least a couple of my students gardeners, green lovers, and maybe even future food bloggers. Last week when we shared our intentions and writing goals for 2013 I told my students about my Lean & Green Smoothie Challenge and they expressed interest in having me bring in my Vitamix to mix them up something mysterious and green.My friend and colleague, Heather Hollands and I share a blog called Blended Voices,and in May of 2011 I wrote a blog post, Nourishing the Joy of Writing, about a magical creative writing retreat we enjoyed with our students. 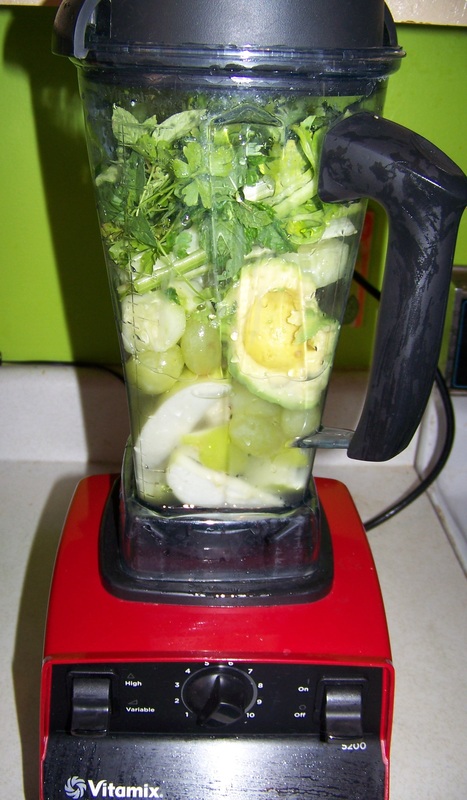 In the morning I made green smoothies for our group and the students were wild about them. 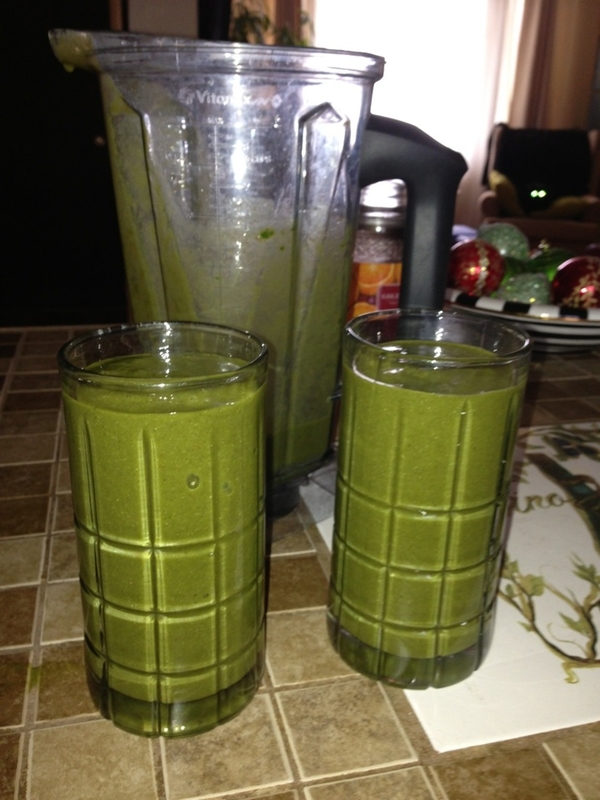 I kept the green smoothies simple and made them with spinach, bananas, and strawberries. It may be a psychological reaction, but with nearly one week of starting each morning off with a green smoothie, I feel energized. So much that today I even finished Day #2 of Jillians Michael’s 30 Day Shred. Not only is Mike joining me on this challenge, but so are many of my friends in my Weight Watchers meeting. Each morning I start a “Green Smoothie” thread on our secret facebook group and we all post our smoothie combinations. We are all getting great ideas as we do this. For example, I am so thankful that one of my friends Sue shared her recipe that contained coconut juice. I immediately added coconut juice to my shopping list. After browsing the internet for ideas I also added fresh ginger, cilantro, and blackstrap molasses. 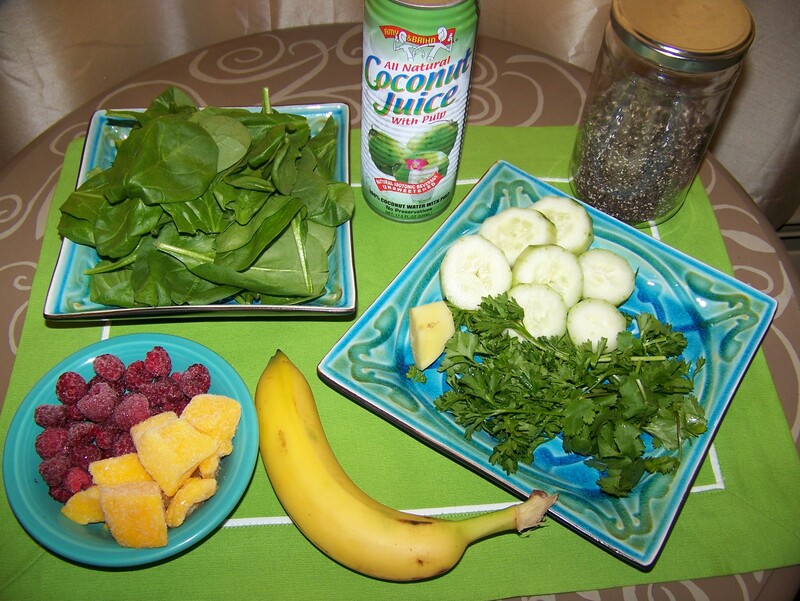 Smoothies are so versatile and can be changed every day which helps one avoid a food rut. 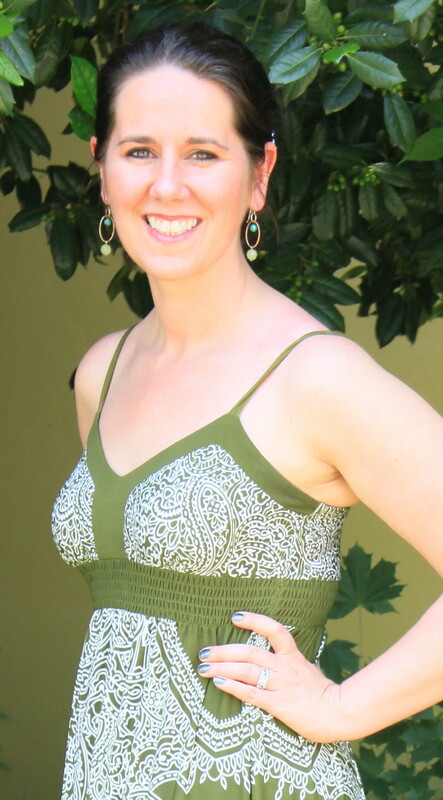 I want to make sure that I am rotating my greens and meeting a wide range of nutritional needs. This morning was not a typical Sunday in our house. Before the coffee maker even began to gurgle our Vitamix broke the silence. Two glasses of liquid mirth were poured and with the first sip my taste buds began a spirited dance. The combination that I whirled together was so phenomenal that this evening I blended a second smoothie and captured pictures for this post. One thing that I quickly learned about becoming a food photographer is that I have to be prepared to take many shots. 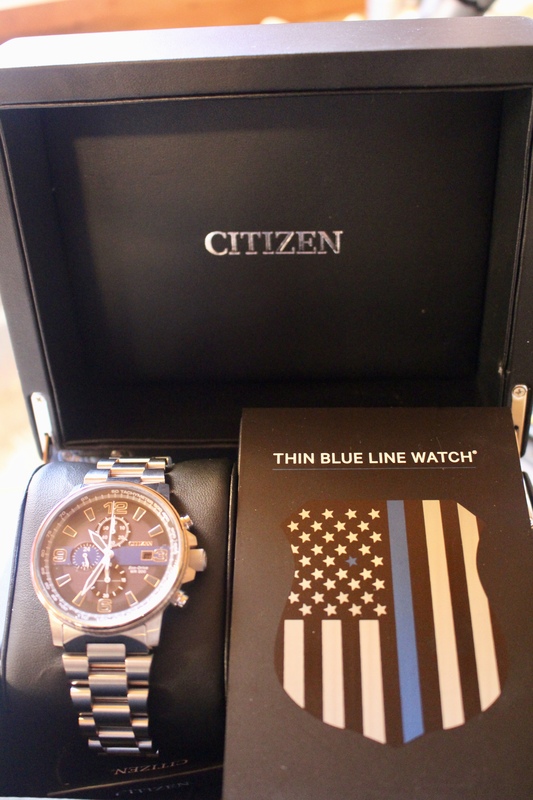 (Please excuse my feeble attempts and I hope to advance my skills as this blog progresses.) Another thing I learned is that my cat Athena really fits the curious reputation that cats hold. The other morning as I was photographing my green smoothie with my iPhone to share with my facebook friends, Athena performed a perfectly orchestrated photo bomb. She was so stealthy that I didn’t even notice until after I posted the picture. 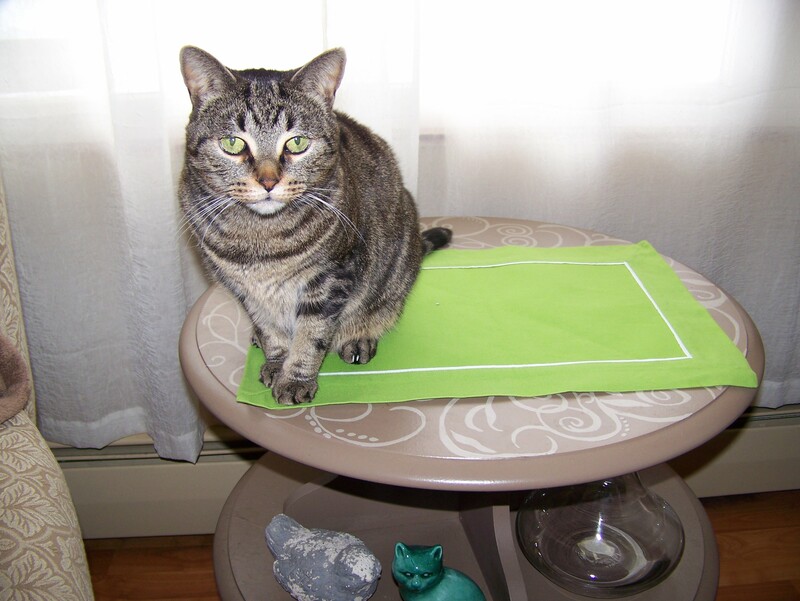 Today was no exception and as I was prepping my table for the smoothie ingredients, Athena was again tempted to check out the area. She must have curled up shortly after because she did not join me as I tried to hone my photography skills. Though anyone who lives in a cat’s house knows that this is the norm. If you are familiar with the U.P. you know how cold and long our winters can be. Today the thermometer was lingering in the low 20s. 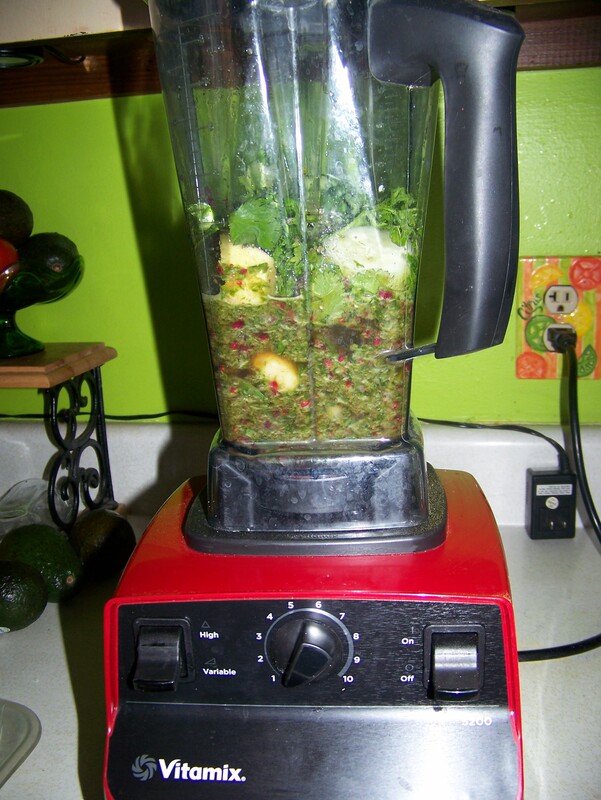 This Green Smoothie Challenge feels like an exotic and colorful change in the normal routine. I wanted to make sure that I shared this morning’s recipe since it made such a delicious impression. The cucumber, cilantro, and ginger made for a refreshing and zingy combination and it took the sting out of a chilly morning. 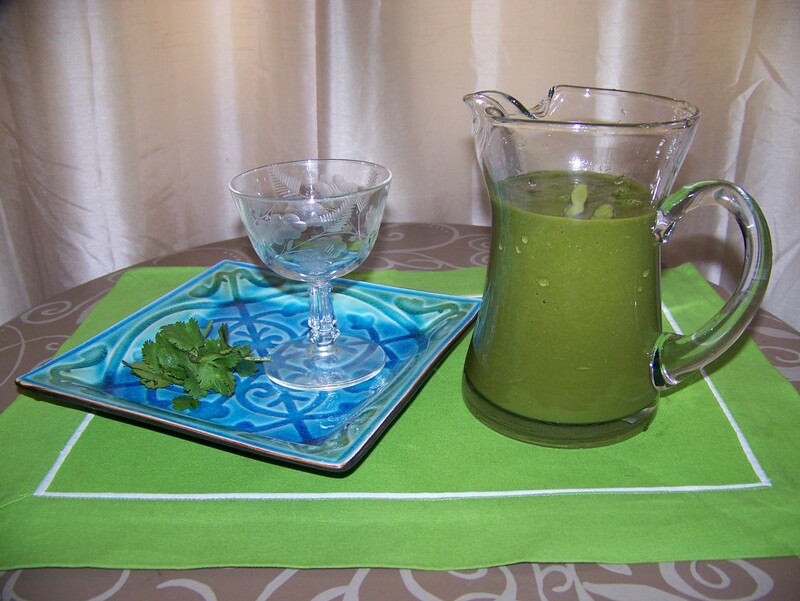 *This recipe rendered 3 cups of Green Smoothie. I hope you enjoy it as much as I did. It is one that I will be making again soon. Happy New Year! Today I am ushering in the new year with two creative projects. The first is my brand new blog, Produce’s, inaugural post and the second will be my Third Annual New Year’s Art Project. 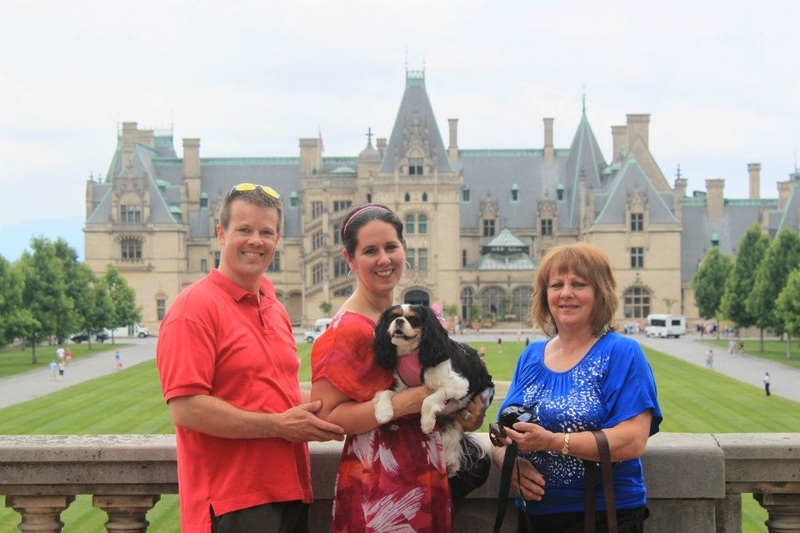 I will be making a mixed medium photo collage from a trip I took in 2012 with my husband Mike, and my mom Karen, to Asheville, North Carolina. The collage will decorate the new walk-in closet that Mike is building from one of our spare bedrooms and recycled materials (the subject for a future post). I want to usher in a year that brims with creative energy and productivity. I truly believe that we need to find joy in our life’s work and when this happens our hearts will be filled with love and wisdom. When we are passionate about what we do and say our lives become rich. Over the past couple weeks I have read postings by multiple social networking outlets asking the universal question, “Will you have a new year’s resolution?” I have found many of the responses enlightening. For example, many people have resolved to not make resolutions while others have shared their hopes to become more outgoing and strive to be a better humanitarian. There is nothing that I enjoy more than a clean slate to start fresh and be positive. Since I am an English teacher, I tend to be naturally reflective and I never hesitate to choose a resolution and go after it with gusto. However, in the past few years I have decided to make a series of health related resolutions throughout the year with a rewards system to help keep me motivated. 2013 will be no exception. My #1 health related goal is getting back to plant based eating and it started today when I fired up my Vitamix blender and made Mike and I a green smoothie with dandelion greens, spinach, frozen banana and strawberries, chia seeds, aloe vera juice, a splash of lemon juice, and water. We ceremoniously clinked our glasses together and promised ourselves and each other that we would be more “lean and green” in 2013. As I prepped our smoothie Mike joked, “Do you remember how to use that gadget?” True, our blender has sat idle for too long. I desired a Vitamix for over three years and FINALLY in June 2012 my dream came true. For over seven months I diligently wore my pedometer and every day that I reached 14,000 steps I put a dollar bill into an envelope for my Vitamix fund. By the time June arrived I had over half of the money put away and Mike surprised me with a Vitamix delivered to our door for my forty first birthday! 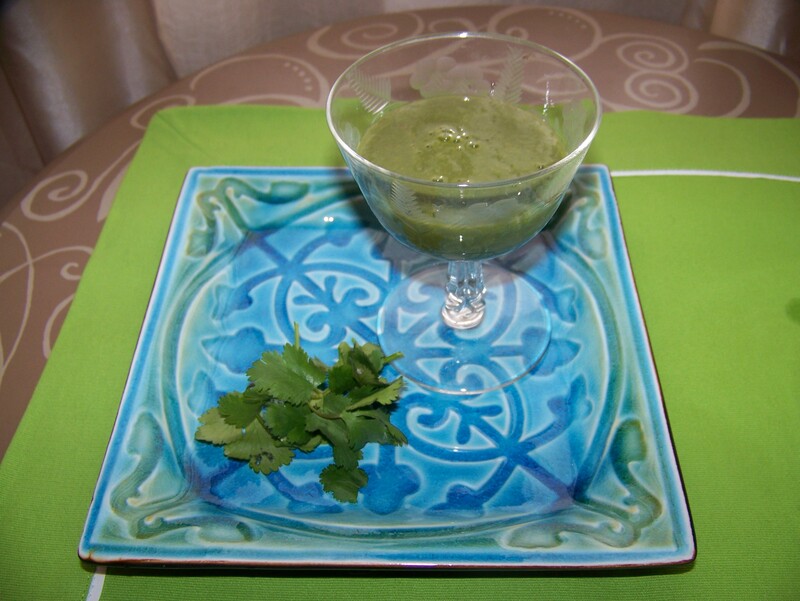 During the summer months our Vitamix got plenty of use whirling up various concoctions of green smoothies, savory green soups, and truth-be-told a margarita or two. But when winter in the Upper Peninsula of Michigan arrived and the temperatures dipped I found myself reaching for standard starchy comfort foods. Looking back I was telling myself that because a food does not contain meat that it was okay for me to eat it. Thus, began an onslaught of spicy and gooey nachos, cheese heaped pizza, and decadent mac-and-cheese. I fooled myself into thinking these things are “healthy” because I loaded them up with vegetables or used whole wheat pasta and crust. From what I have heard this is often a problem with many lacto ovo vegetarians. As a Weight Watchers leader for the past five and a half years I have had many new members complain that being a vegetarian does not automatically make one thin. It’s been a couple years since I’ve given up meat and I need to go back to a plant based meal plan. For the month of January I will commit to having at least one green smoothie a day and will not consume ANY dairy or eggs. Since I will be avoiding processed food (it seems that nearly ALL contain some sort of animal by-product) I will be eating cleaner and I know my energy levels will increase. Ultimately, I want 2013 to be a healthy year. 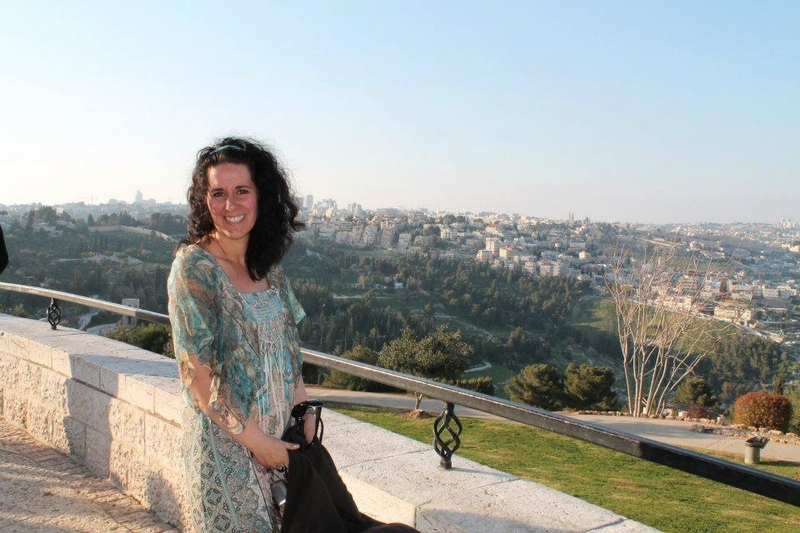 In the spring of 2012 I had an amazing opportunity to travel to Poland and Israel with a group of educators. I am a member of the Holocaust Educators Network that is funded by the Memorial Library in NYC. Having this trip to look forward to I worked hard for months to get in shape and be at a weight that I felt comfortable. Unfortunately, all my hard work came undone in the past few months and to get back to my goal weight I need to lose thirteen pounds. 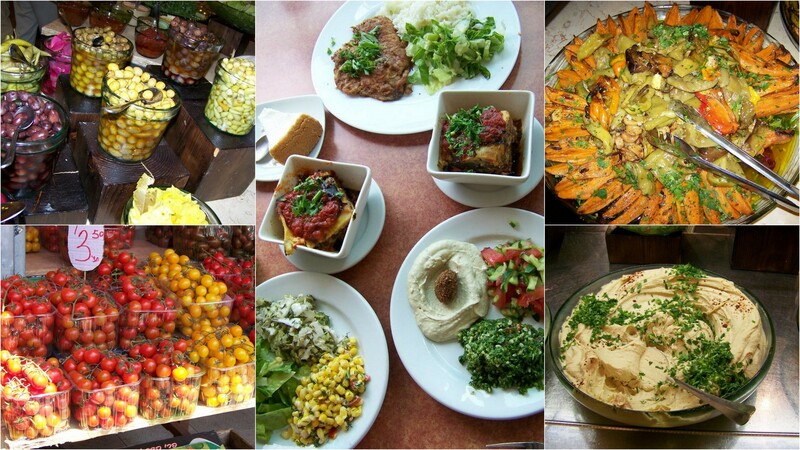 The reason that I bring up Israel is that I must say that it was easy to eat plant based meals while traveling in Jerusalem, Masada, Tel Aviv, and Jaffa. 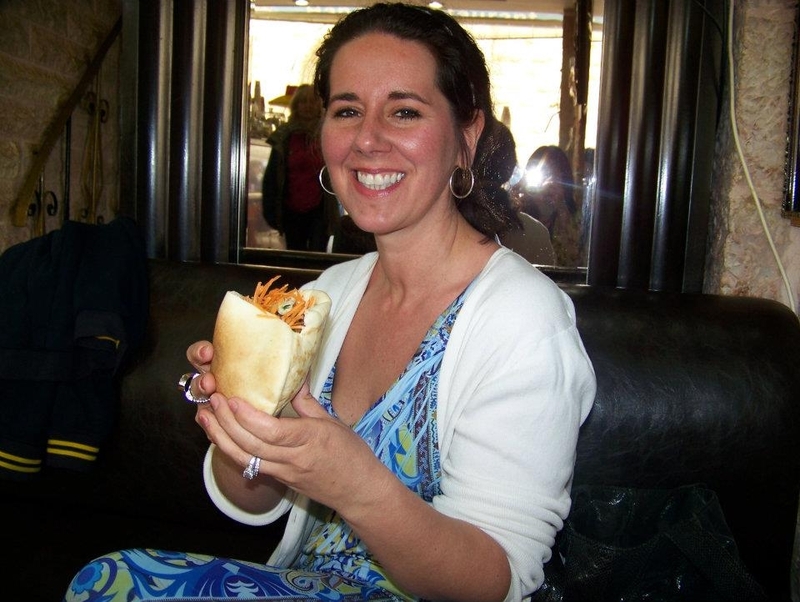 The fruit and vegetable markets displayed a gorgeous array of fresh produce, the vendors offered luscious falafels and fresh squeezed orange juice, and the hotels we stayed at had an ample supply of delicious dishes featuring vegetables. My mouth waters remembering the stunning trays of roasted zucchini, compotes of olives, and giant bowls of guacamole and hummus. I will be channeling Israeli food in the coming months as I prepare healthy meals for Mike and I.
I spent a lot of time anticipating the new year and now that it is here, I am excited I got my feet off the ground on the next step of my journey to maximize my health and lead an active lifestyle. I am dusting off Lindsey Nixon’s “The Happy Herbivore Cookbook, ” the Vitamix “Whole Foods Cookbook,” and Victoria Boutenko’s, “Green Smoothie Revolution” to whip up some nutritious and satisfying meals. Now I need to get to work on my collage project and visit the treadmill. In 2013 for every day of formal exercise that I get in, I will be putting a $1 in my envelope. My first reward will be a Clarisonic skin care system. My goal is to produce here in writing at least once a week, which I hope will help me stay accountable to my goals. Since teaching is my calling, I hope I can inspire others along the way. 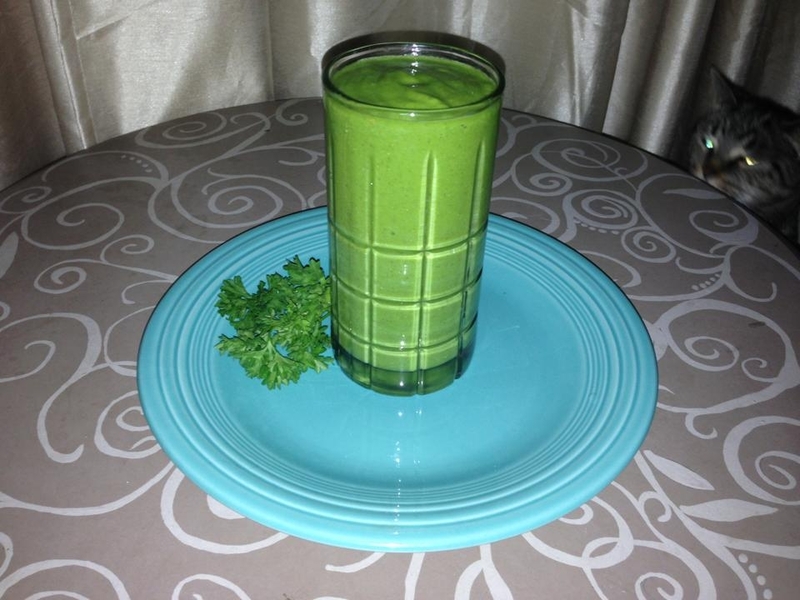 Maybe you will decide to join me in having a green smoothie a day in January? Cheers to a lean and green 2013!